The Capital City Downtown Plan sets a course for City investment in catalyst projects designed to promote downtown development. Including new pipes, parks and streets, these investments are transforming the heart of Edmonton into a vibrant, accessible and sustainable community. Council has approved a boundary for the Capital City Downtown CRL. The City estimates that the Capital City Downtown CRL will generate sufficient revenue over its 20 year life to fund approximately $500 million in new infrastructure downtown. 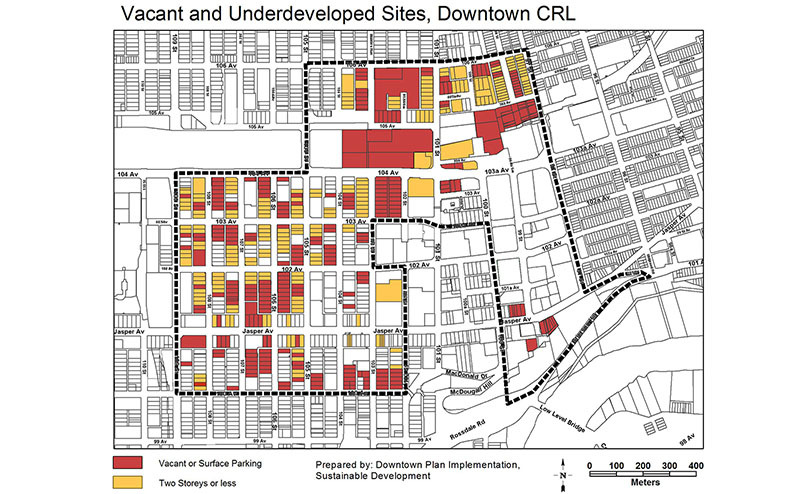 Only areas within the CRL boundary contribute to the Downtown CRL. In 2013, over half of the land in the CRL boundary was vacant or underdeveloped. The City estimates that the Capital City Downtown CRL will generate sufficient revenue over its 20 year life to fund approximately $500 million in new infrastructure downtown. The projects have been approved by Council as part of the CRL Plan (Bylaw 16521). Spending for each project will not happen until City Council approves each project’s capital budget. Growth of new developments with the Downtown CRL boundary has been notable. However, the CRL spans 20 years, which means revenue projections will fluctuate as economic conditions change. To manage this risk, Council has not approved CRL funding for all the catalyst projects listed in the Downtown CRL. Instead, the City reviews each CRL on an annual basis to reassess cost and revenue projections. Then, the City will look at the sequencing and timing of the catalyst projects, and make adjustments as needed. Once the review is done, Council can then approve funding for future catalyst projects. The City’s projections show it is likely the Downtown CRL will generate enough revenue to fund all of the projects in the CRL plan. This includes Roger Place, and also new parks, sewer lines, and Downtown street improvements.